Nearly three months after the Republican Party took control of the White House and Congress, the public gives low job ratings to the president and even lower ratings to the speaker of the House. The new Congress is viewed about as unfavorably as the previous Congress. And while both parties are viewed less positively than in January, the GOP’s ratings are more negative than the Democratic Party’s. 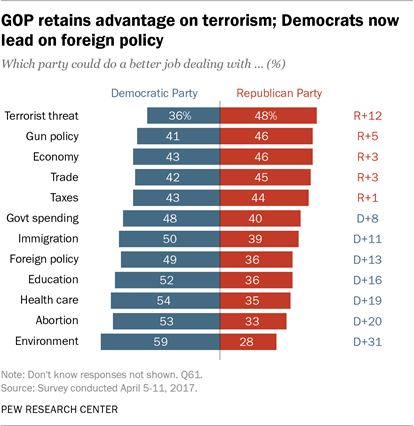 On issues, the Republicans hold their traditional advantage on terrorism, and the two parties continue to run about even on handling the economy – which, along with terrorism, tops the public’s agenda. But the Democratic Party has made sharp gains compared with a year ago on several issues – notably, foreign policy and immigration. Currently, 49% of Americans say the Democratic Party is better able to make wise decisions about foreign policy, while 36% favor the GOP. A year ago, Republicans were favored on foreign policy, 46% to 38%. Democrats also lead on dealing with immigration, 50% to 39%; in recent years, the parties have run about even on this issue. And, with budget debates looming this month in Congress, 48% say the Democratic Party better represents their views on government spending, while 40% say the Republican Party does. The national survey by Pew Research Center, conducted April 5-11 among 1,501 adults, finds some signs of public disillusionment with both parties. The favorability ratings of both parties have declined since January – seven percentage points for the Republican Party (from 47% to 40%) and six points for the Democratic Party (51% to 45%). Less confidence in Trump in dealing with Congress. Donald Trump’s overall job rating stands at 39%, the same as it was in February. 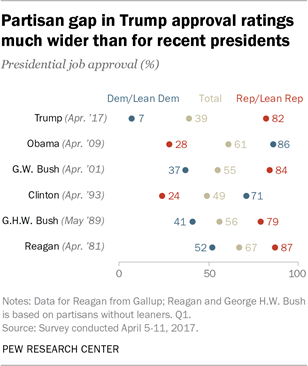 As was the case then, his job rating today is lower – and more politically divided – than other recent presidents at comparable points in their first year. For more, see detailed demographic tables on Trump job approval. In addition, fewer than half (46%) are very or somewhat confident in Trump’s ability to work effectively with Congress; in December, this had been seen as a relative strength for Trump – 60% were confident he could work well with Congress. Over this period, the share expressing confidence in Trump to avoid major scandals in his administration also has fallen eight percentage points, from 44% to 36%. Many see U.S. in weaker position internationally. The public is divided in its views of the impact of Trump’s policies on terrorism. While 31% say Trump’s policies have made the U.S. safer when compared with the policies of Barack Obama’s administration, 33% say they have made the country less safe; another 33% say they haven’t made much of a difference. But more say Trump’s policies have placed the U.S. in a weaker than stronger position internationally (45% vs. 31%), while 20% say his policies have put the U.S. in about the same position as Obama’s policies. Ryan’s negative job rating. Just 29% approve of the way Paul Ryan is handling his job as speaker of the House, while nearly twice as many (54%) disapprove. About half of Republicans and Republican-leaning independents (51%) give Ryan a positive job rating, while 31% disapprove. Democrats and Democratic leaners overwhelmingly disapprove of Ryan’s job performance (75% disapprove). Republican Party still seen as “mostly divided.” About two-thirds of the public (68%) say the Republican Party is “mostly divided,” while just 29% say it is “mostly united.” In October, 80% of registered voters said the GOP was divided. By contrast, about as many say the Democratic Party is divided as not (48% mostly divided, 49% mostly united). But that represents a change from October, when 39% of registered voters thought the party was divided. 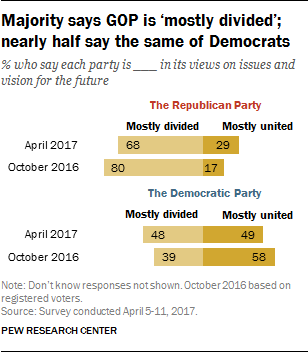 In the current survey, 57% of Republicans see their party as mostly divided, while a similar majority of Democrats (58%) say their party is mostly united. Views of parties’ traits. The public’s overall impressions of the parties are little changed from about a year ago. About half (52%) view the GOP as “too extreme,” while fewer (40%) say that phrase describes the Democratic Party. Democrats also are more widely viewed as having “good policy ideas” (58% say this applies to the Democratic Party, 49% to the GOP). But neither party is widely seen as having “high ethical standards.” About half (49%) say this describes the Democratic Party and 45% say it applies to the Republican Party. Republicans say GOP lawmakers not obliged to support Trump. A majority of Republican and Republican leaners (55%) say Republicans in Congress are under no obligation to support Trump’s policies if they disagree with him. About four-in-ten (43%) say they have an obligation to support his policies because he is a Republican president. Low awareness of House Freedom Caucus. Just 19% of the public says they have heard “a lot” about the House Republican group known as the Freedom Caucus; 39% say they have heard a little about the group, while 42% have heard nothing at all. Republicans who have heard at least a little about the group view it favorably by more than two-to-one (59% to 25%); Democrats who have heard of the Freedom Caucus view it unfavorably by a wide margin (66% to 19%).